WASHINGTON, July 8, 2014 – After a promising 3 month run, June’s Optimism Index fell 1.6 points to 95.0. While job components improved, capital outlays and planned spending faded along with expectations for improving business conditions. Overall only two Index components improved, two were unchanged, and six fell. • Labor Markets. NFIB owners increased employment by an average of 0.05 workers per firm in June (seasonally adjusted), the ninth positive month in a row and the best string of gains since 2006. Seasonally adjusted, 12 percent of the owners (up 1 point) reported adding an average of 3.3 workers per firm over the past few months. The remaining 75 percent of owners made no net change in employment. Fifty-three percent of the owners hired or tried to hire in the last three months and 43 percent (81 percent of those trying to hire or hiring) reported few or no qualified applicants for open positions. • Inventories. The pace of inventory reduction was steady, with a net negative 4 percent of all owners reporting growth in inventories (seasonally adjusted). The net percent of owners viewing current inventory stocks as “too low” was unchanged at a net negative 2 percent, still a “lean” reading. Sales trends deteriorated a bit but remained at the best levels in the recovery, just historically weak. Expected real sales weakened as well, and this contributed to less urgency to rebuild stocks. The net percent of owners planning to add to inventory stocks fell 2 points to a net negative 1 percent. While inventories have been building solidly at the national level (a car inventory bubble), it appears that the small business sector is adding only a little to the accumulation of stocks reported in the GDP accounts and sales are too weak to produce much liquidation. 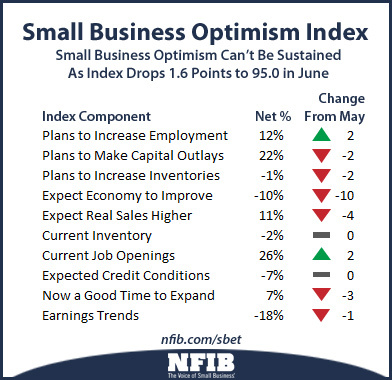 Today’s report is based on the responses of 672 randomly sampled small businesses in NFIB’s membership, surveyed throughout the month of June. Download the complete study at http://www.nfib.com/sbetindex.